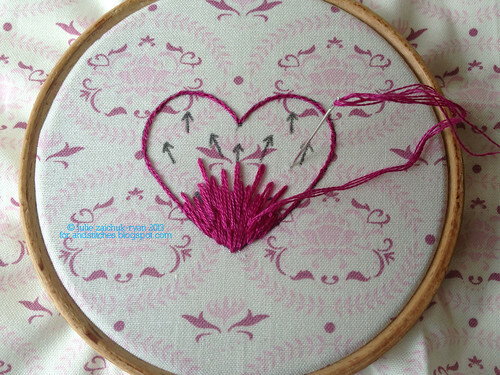 Although it's a proper stitch in its own right, long-and-short stitch is also a great alternative to satin stitch. 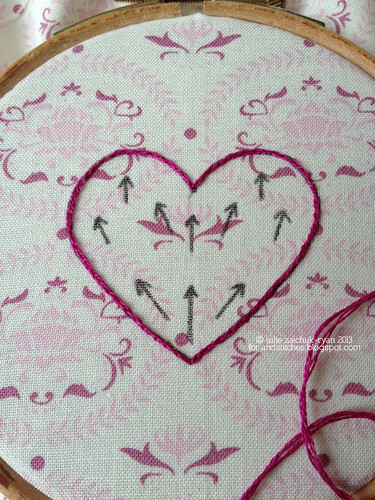 When your shape is a little too big and you feel that satin stitches would be too long - resulting in puckered stitches or loose stitches that don't stay in place - long-and-short stitch saves the day! It looks kind of intimidating though, doesn't it? Like it really takes a long time to be good at it? But it really doesn't! 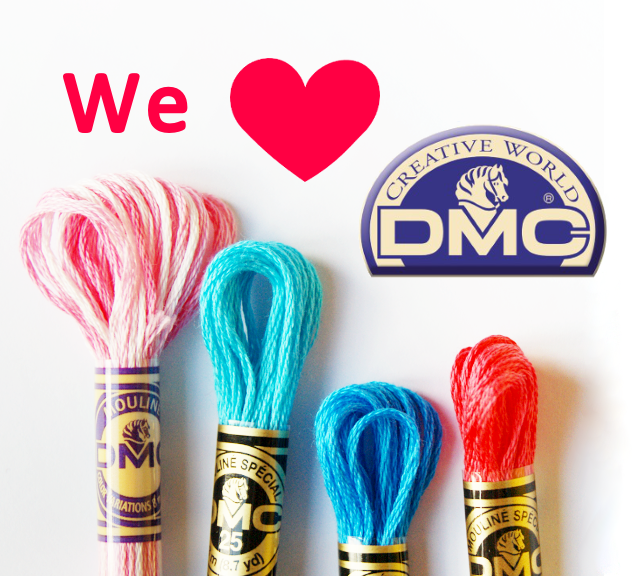 The truth of the stitch is that the less you think about it, the better it looks. 6.) As you get to the top of your shape, tuck your last stitches around the top of the outline, and that's it! Because your stitches came up and down at random places, you should see a smooth, solid fill and no obvious lines where they grouped together. 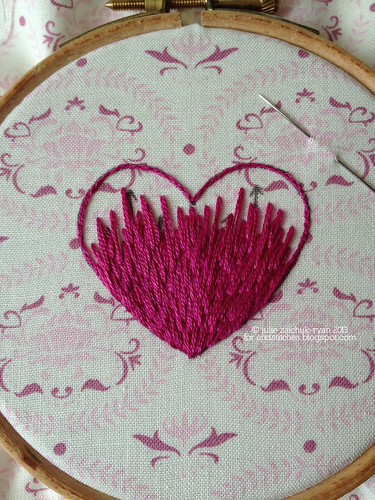 If you notice any bits that could be smoother, don't be afraid to just plop another stitch over it to even it out! I hope you enjoyed playing with long-and-short stitch today - and if you do any practice, please come show off in the &Stitches Flickr group! 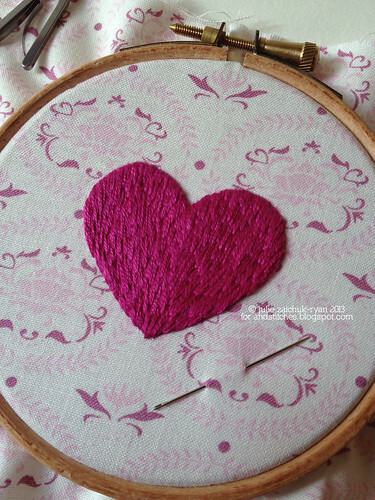 Wonderful tutorial ~ your heart is lovely! absolutely lovely, great overall effect! Did you read my mind? 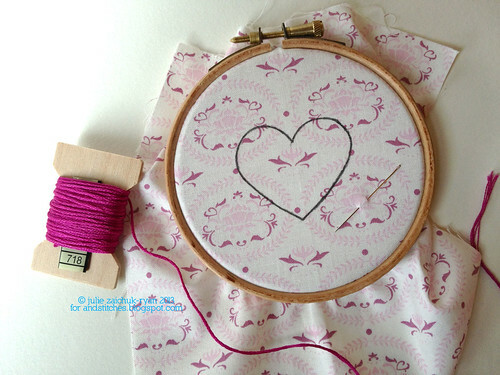 Just last night I was pondering how to fill a heart with long and short stitches, and here you show me in perfect detail. Thank you! One of the prettiest little hearts ever! These tutorials you are sharing are wonderful and I thank you for the time and effort. 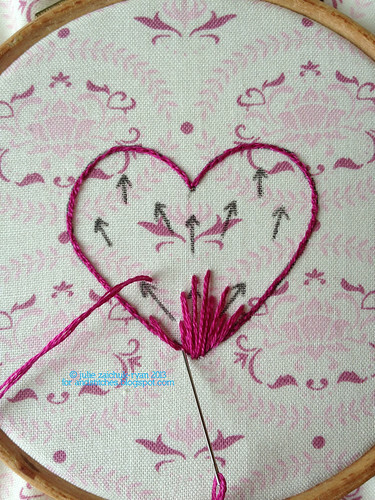 Bookmarked this one along with the satin stitch. The only embroidery i am working on at this time is my Dutch Canal Houses - so it looks like I will be incorporating stitches learned from your tutorials into the houses! Definitely need hearts on one of the houses - right? Well, we thank you very much! How sweet of you! I'm *so* glad you all liked this tutorial! I hope you'll give it a go and show us in the Flickr pool! I'd love to see! Hi Rachel! I'm SO sorry it took me a few days to see your comment!! 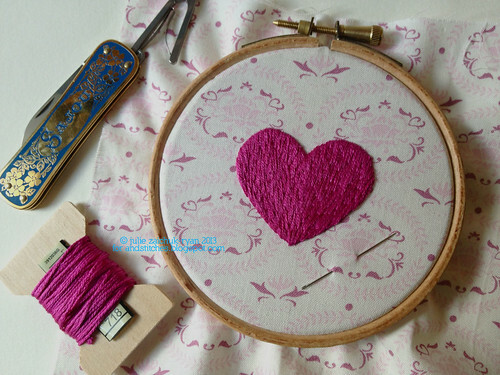 It's true that this stitch *really* eats up thread, it's not just you! It should be making a really thick and somewhat padded effect, since there's so much overlapping going on. I used four strands for this example to cover space faster, and I went through thread incredibly fast! I think it took me about 5 waves to cover the shape (which is 1.5" tall). If you'd like to post a photo on Flickr and / or email me for more help ( julie [at] button-button [dot] co [dot] uk ), I'd be happy to help make sure you're on the right track! You're very welcome, I'm happy to help where I can! I think the stitch length isn't really a problem as long as they are covered randomly with other long and short stitches - if that makes sense? A really long stitch is fine, but make sure you interrupt a few of them low down on the stitch, a few up high on the stitch, etc. If you are still having trouble, please do feel free to email me a photo and I'll see what I can suggest!